So you may remember a while back my Aunt Jenny gave me a jar of tahini as a secret ingredient challenge. She wanted me to make something with it that wasn't hummus. So, my first recipe was tahini cookies that were delicious. But I knew I wanted to make some sesame noodles too. I threw in some veggies and chicken to make a meal out of it. Jax loves to eat noodles. He is pretty crafty at picking around the broccoli though. We are lucky enough to have some broccoli in the garden, so all we had to do was wander out to get some. What a delicious way to use some of our harvest! In a small bowl, mix together tahini, soy sauce, water, sugar and sriracha. Set aside. Add chicken and carrots to the pan. Stir frequently until chicken is cooked through. Add broccoli florets and continue to cook for another 3-4 minutes. 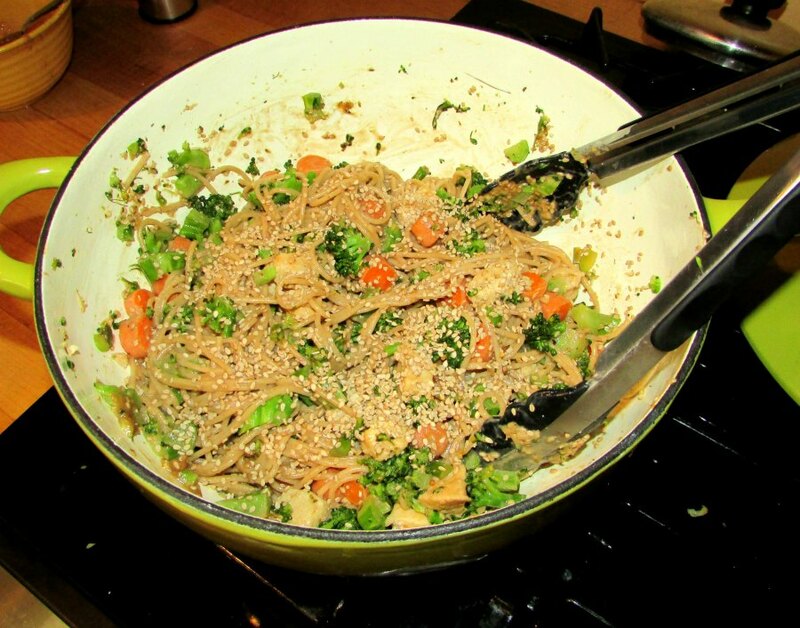 Stir in noodles and sesame seeds. Pour sauce over everything and toss to coat. Garnish with more sesame seeds or some cilantro if desired. Thanks! I hope you did too! We spent a lot of time outside playing with the little guy. I had last week off, so it was really hard getting back into the swing of things today! These recipes look great! Thanks for sharing at the #AnythingGoes Link Party. Thank you and thanks for hosting! Have a great week! Looks delicious and I love noodles. Thanks for sharing the recipe with us at #WednesdaysWisdom. Love the photos! This was a fun way to have them! Thanks so much for stopping by! Thanks for sharing - I need to cook more Asian food, and this recipe sounds delicious! It was really good! Thanks for stopping by! I never thought to use whole wheat spaghetti in stir fry/ Asian inspired cooking! Thanks for sharing! I always have them on hand, so it is any easy substitute for soba noodles or rice noodles. The whole wheat goes really well with the sesame! It has been a lot of fun coming up with ideas. I am glad she thought of it! Chicken and Sesame Noodles sounds like a great dish to try. Hope you are having a great day and thanks so much for sharing your awesome post with Full Plate Thursday. We all loved them. It was a hearty break from our normal dinner routine! Can't wait to try these! Thank you so much for linking up at Tasty Tuesday! This post has been pinned on the Tasty Tuesday Pinterest board! I love having you and can't wait to see you next week! This sounds yummy. I recently bought a big jar of tahini to use to make basil hummus and have been wondering what to do with the rest of it. Thanks for the recipe. 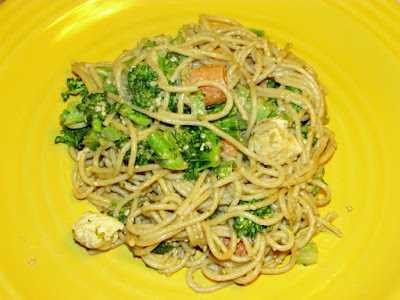 We love noodles at my house - I can't wait to try this recipe! Thanks so much for sharing it with us! We do too, I hope you love them this way! Sounds delicious! This is definitely something my family will love. Thanks for sharing at Inspiration Thursday! See you next time! Yummy!! Thanks for sharing on My 2 Favorite Things on Thursday!! Hope to see you again!! I love having you!! Pinned!! I love the combination of Chicken and Sesame Noodles, I'm looking forward to trying your recipe. Thank you for sharing with the Clever Chicks Blog Hop! I hope you’ll join us again next week! It was a delicious way to make it a filling meal in one dish. Thanks for hosting! Me too, cleanup is so much easier that way! Thanks for hosting! Ha! They must have really left an impression! Thanks for stopping by, Kathleen!